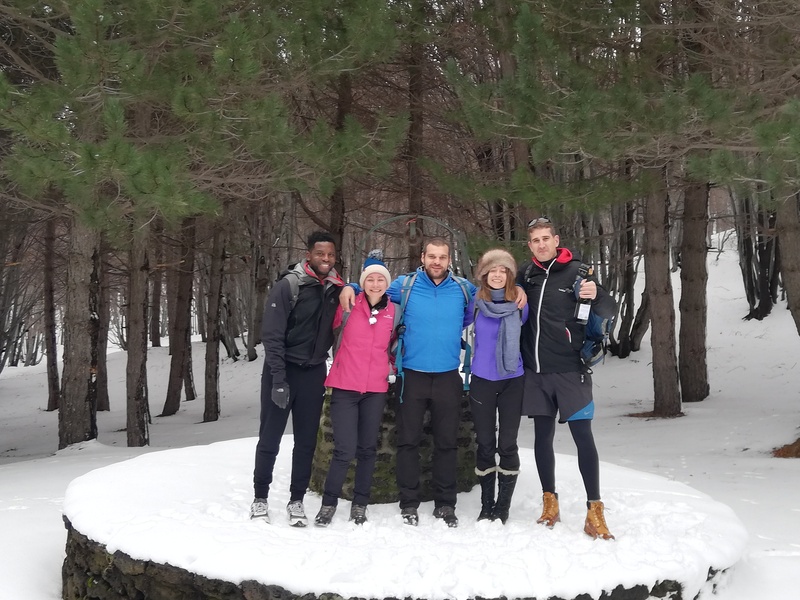 Duration from 9.00 a.m. to 6.00 / 6.30 p.m.
One of Etna Experience’s expert guides will lead you along a beautiful naturalistic trekking path, while explaining the origins of our volcano Etna. You will then reach a scenic spot that overlooks the Bove Valley, the last eruptions main scenario, where it will also be possible to enjoy an amazing view on the Summit Craters. You will visit a volcanic cave using the equipment provided by us (helmets and torches). In case of heavy snow and/or ice the visit may be cancelled for safety reasons. 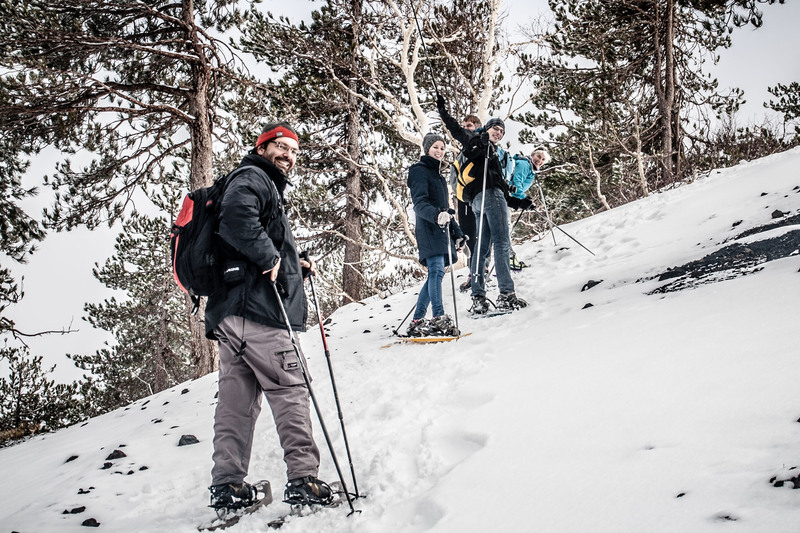 In case the cave should not be accessible, because of ice and snow, the guide might suggest you an extra trekking on a different trail, or a visit to the area of Zafferana Etnea to taste local products of the volcano. At lunch we will gather in a typical Etna Rifugio. There we will enjoy a typical Sicilian lunch with local products (starter and first course) together with a good glass of Sicilian Etna wine. It is possible to arrange, upon request, a suitable dish to vegetarians, vegan and coeliacs. Walking through brooms, chamomile and silver birches, you will visit unique lava formations and ancient craters, usually on the North-East side of Etna. 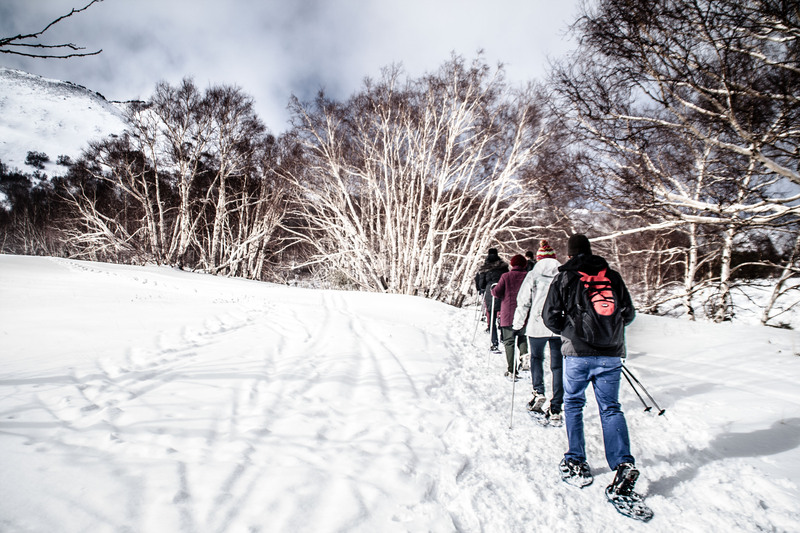 * In case the trails are covered by a thick layer of snow, usually around the month of January (but sometimes also in February or even March), part of the excursion will take place using snowshoes (provided by us) and sticks. We wish to remind you that in this case the hike becomes normally more tiring. A professional and passionate naturalistic guide (our guides are geologist, volcanologists, agronomists, etc…). Transport service with jeep or minibus from Catania, directly from your hotel or from an agreed meeting point. Lunch in a Rifugio. Insurance with our Tour Operator. Licensed Transport Service. Water. Equipment, if required when booking. 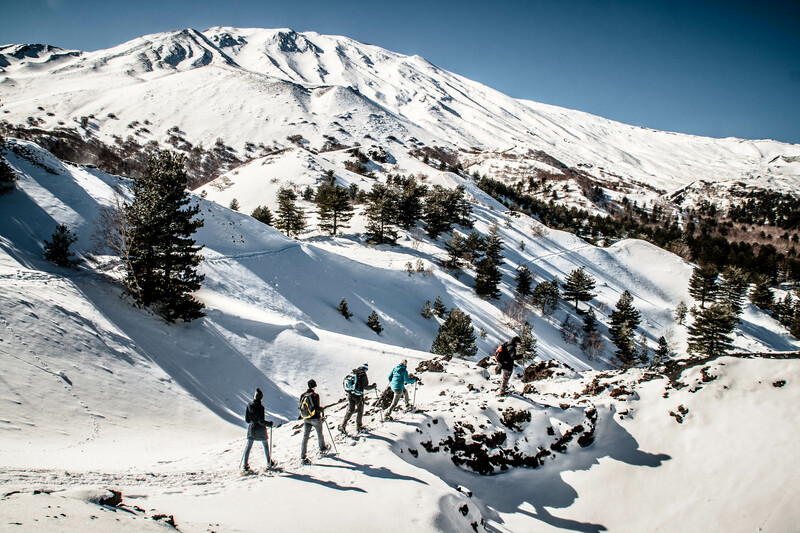 The excursion on Etna will take place in Italian and English. (Upon request and according to the availability also in Spanish and French). 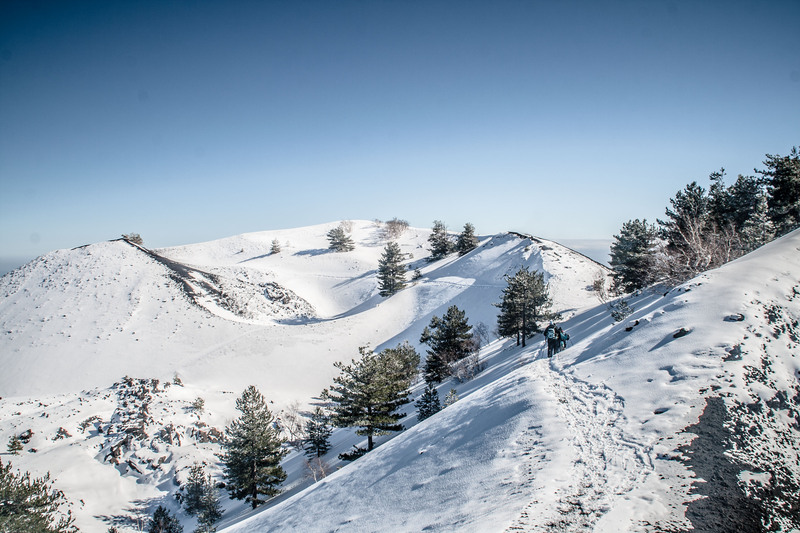 We remind you to wear closed and sturdy shoes (trekking) with thick socks, and to bring a winter jacket because the temperature at a higher altitude will be lower (about 10° to 15° degrees lower than in Catania). In case of snow we also suggest to bring along an extra pair of socks, we will provide snowshoes and sticks. Please remember to bring with you a small bottle of water, to use during the trek. If you believe you might not be well equipped, let us know when booking the tour. In that case shoes and jackets will be provided. We strongly advise not to attend the Etna excursions to those who are not in good health, especially to people suffering from cardiorespiratory diseases.